Dominic Paul "Dom" DiMaggio (February 12, 1917 – May 8, 2009), nicknamed "The Little Professor", was an American Major League Baseball center fielder. 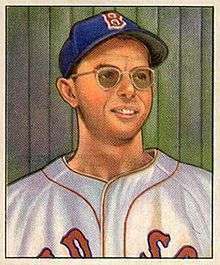 He played his entire 11-year baseball career for the Boston Red Sox (1940–1953). He was the youngest of three brothers who each became major league center fielders, the others being Joe and Vince. An effective leadoff hitter, he batted .300 four times and led the American League in runs twice and in triples and stolen bases once each. He also led AL center fielders in assists three times and in putouts and double plays twice each; he tied a league record by recording 400 putouts four times, and his 1948 totals of 503 putouts and 526 total chances stood as AL records for nearly thirty years. His 1338 games in center field ranked eighth in AL history when he retired. His 34-game hitting streak in 1949 remains a Boston club record. He was the youngest of three brothers who each became major league center fielders: Joe was a star with the rival New York Yankees, and Vince played for five National League teams. The youngest of nine children born to Sicilian immigrants, Dom's small stature (5'9") and eyeglasses earned him the nickname "The Little Professor." After breaking into the minor leagues in 1937 with the San Francisco Seals of the Pacific Coast League, Dom DiMaggio's contract was purchased by the Red Sox following a 1939 season in which he batted .361; he hit .301 in his 1940 rookie season, becoming part of a .300-hitting outfield with Ted Williams and Doc Cramer. In both 1941 and 1942 he scored over 100 runs to finish third in the AL, and was among the league's top ten players in doubles and steals; he was named an All-Star both years. After missing three years serving in the Navy in World War II, he returned in 1946 with his best season yet, batting .316 to place fifth in the league, and coming in ninth in the MVP voting as Boston won its first pennant in 28 years. Batting third, he hit only .259 in the 1946 World Series against the St. Louis Cardinals, but was almost a Series hero for Boston. With two out in the eighth inning of Game 7, he doubled to drive in two runs, tying the score 3-3; but he pulled his hamstring coming into second base, and had to be removed for a pinch runner. The result was costly, as Harry Walker doubled to center field in the bottom of the inning, with Enos Slaughter scoring from first base in his famed "Mad Dash" to win the game and Series for St. Louis; had DiMaggio remained in the game, Walker's hit might have been catchable, or the outfielder's strong arm might have held Slaughter to third base. "If they hadn’t taken DiMaggio out of the game", Slaughter later said of his daring sprint, "I wouldn’t have tried it." After an offensively disappointing year in 1947, DiMaggio rebounded in 1948 to score 127 runs (second in the AL) with career highs in doubles (40), runs batted in (87) and walks (101). His 503 putouts broke Baby Doll Jacobson's AL record of 484, set with the 1924 St. Louis Browns; his 526 total chances surpassed the league mark of 498 shared by Sam Rice of the 1920 Washington Senators and Jacobson. At the time, the marks ranked behind only Taylor Douthit's totals of 547 and 566 with the 1928 Cardinals in major league history; both records stood until 1977, when Chet Lemon of the Chicago White Sox recorded 512 putouts and 536 total chances. In 1949 DiMaggio batted .307 with 126 runs, and had his team-record 34-game hitting streak; ironically, the streak was ended on August 9 by an outstanding catch made by his brother Joe. That year he made 400 putouts for the fourth time, tying the AL record held by Sam West of the Senators and Browns; the mark was later tied by two other players before being broken by Lemon in 1985. In 1950 DiMaggio led the AL in runs (131), triples (11) and stolen bases (15) while hitting a career-high .328. On June 30 he and Joe hit home runs while playing against one another, becoming the fourth pair of brothers to homer in the same game. Dom's stolen base total of 15 is the lowest stolen base total to lead either of the Major Leagues in a single season. In August of that year, he had 53 base hits, tying a club record with teammate Johnny Pesky. He again led the league in runs (113) in 1951, when he had a 27-game hitting streak from May 12 to June 7. He retired in May 1953, after appearing in only three games that year as a pinch hitter, with a .298 batting average, 1680 hits, 308 doubles, 87 home runs, 1046 runs and 618 RBI in 1399 games. He was selected an All-Star seven times (1941–42, 1946, 1949–52). His career average of 2.98 chances per game remains the record for AL outfielders. DiMaggio enjoyed a close friendship with teammates Ted Williams, Bobby Doerr, and Johnny Pesky, which was chronicled in David Halberstam's book The Teammates. After retiring, he became a plastics manufacturer in New England. He was inducted into the Boston Red Sox Hall of Fame in 1995. He and his wife Emily, whom he married in 1948, had two sons (Paul and Peter), a daughter (Emily), and several grandchildren (Alex, Andrew, Charlotte, Margel, Peter, and Anna). In an article in 1976 in Esquire magazine, sportswriter Harry Stein published an "All Time All-Star Argument Starter", consisting of five ethnic baseball teams. Dom DiMaggio was the left fielder on Stein's Italian team. In 1978 he was named a member of the Board of Trustees at Saint Anselm College in Goffstown, New Hampshire. He served under Presidents Father Peter and Father Jonathan DeFelice and helped lead Saint Anselm College through four decades of expansion; he was awarded an honorary degree in 1999. Writer David Halberstam described Dom as "probably the most underrated player of his day." DiMaggio died on May 8, 2009 at his home in Marion, Massachusetts. He was 92 years old and had been suffering from pneumonia. ↑ The editors of the Sporting News (1992). Baseball A Doubleheader Collection of Facts, Feats, & Firsts. St. Louis, Mo. : The Sporting News Publishing Co. ISBN 0-88365-785-6. .
↑ "Former Red Sox star Dom DiMaggio dies at 92". The Boston Globe. May 8, 2009. ↑ "Former Red Sox great Dom DiMaggio dies at 92". Associated Press. 8 May 2009.